Roy: Just go briefly over the bats, kind like baseball and little league and whatever. And let’s just kind of chat about the whole nanotech thing and what it is and etc. Anderson Guy: Do you want to get into some of the technical aspects of the nanotech first? Anderson Guy: If you think about it, there are really three or four technologies that Anderson uses in their bats. They use a double wall. And they use two version of the double wall, and I will show you the difference. One is an internal sleeve and one is an external sleeve. Then we do this new nanotech technology. And then we do just a basic Pyrotech single wall bat. So if you consider that you have the two double wall technologies, internal and external, you could possibly count that as two, but otherwise it is three technologies. Rob: Can you explain what an internal and external sleeve is? Anderson Guy: I will show you the difference. We will start with baseball first. We will go the way the catalogue goes and then we will go into internal/external sleeves. I am going to show you a couple Conways, too. Roy: I just read the first little bit. Anderson Guy: How does it look? Is it pretty much what you need, do you think? I haven’t seen it. Rob: For me it is marketing copy that I either need to dumb down or wash all the marketing speak off of it. Anderson Guy: I have not read it. Apparently that is the way he described it. He described it as sort of a mix of advertising talk and conversational pieces. Roy: I would say you need to dumb that down. Anderson Guy: If you go to the first page, this is just going to give you three ideas of the technology that they use. The first just gives you the information on the vibration that flex management…That part probably doesn’t mean all that much. The key is the second part, which is the power arch multi-wall construction. That is the double wall that we were talking about. And then the next section is acoustic enforcement technology. That is the foam, and I will show how that works. I was going to show you in the core of the bat and also show you this foam that is a separate piece and how they do all that stuff. So when you go to the page after that then, you have the Nanotech category, the Nanotech Excess which is there adult baseball bat. This is a new technology that they came out with. They have been working on it for about 10 years. It shows you the little diagrams that talk about the grains in the bat. The simple principle is that when they do this nanotech alloy, it makes it very durable. In baseball and softball, the idea is if you can thin the wall of bats and make them very flexible, you are able to hit the ball a lot better. The problem is when you do that they are not as durable. So they bend a lot easier. So the feeling always was you have got to figure out a way to make the walls durable but thin enough that you can get that trampoline effect of the ball off the bat. And they think they have discovered that way to do that. So what they are doing is they take this nanotech technology. They apply it to the barrel of the bat. And you can tell…I have another sample in the car. But you see where this little break is here and that break is there? That is actually the hitting surface. Usually the sweet spot of a typical baseball or softball bat is very small. This is the sweet spot of the bat on this particular nanotech technology, both on this one and on the kids bat. So you have a much larger hitting surface. Very durable, very flexible, and the thing lasts like crazy. The sample that I have in the bag I bring to batting cages and let them use the thing. You just beat it up and you wash it off. The thing doesn’t dent at all. It is goods for thousand and thousands of hits. It hits well, plays well, but very durable. It is also very expensive. Rob: What is the price point on that? Anderson Guy: It is $500 retail. The regular one piece price is $249. Rob: It is an alloy, so it is all metal? Anderson Guy: It is all metal. No composites at all. They had a composite bat in the lineup one time. 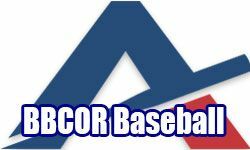 I am sure you are aware of all the stuff that took place last year of all the composite changes with ASA and USSSA. So they are completely out of the composite business here. They don’t want to mess with composites. They think aluminum alloy is the way to go. I just got this sample yesterday. You have the adult version. Rob: So what is the difference between that bat…? Anderson Guy: Same bat. This is just a kid’s version. This is senior league, so the way the catalogue breaks down, you have adult, which is the regular Nanotech Excess, then you get down to Senior leagues, Nanotech XT. So that one is a -5. With the adult bat it is a -3. Other than that it is the same technology. So those two bats are the same. And then you get down into this next one, this KXR bat, and this does not use the Nanotech technology. It is a single wall bat. I just got that sample yesterday. Roy: Did you have any printouts of those, of the Nanotech’s? Anderson Guy: No they don’t, because it is a regular single wall. The only ones that we do cutouts on are the double walls because it is a slightly different technology that DeMarini is using in their double walls, and you will see that when I show you these samples. Rob: As far as durability goes, like returns, do you see returns on the Anderson bats as a percentage? Roy: No. Granted, yeah, we sell more of the other manufacturers, but at the same time…The only thing I could say as far as return problems, the Rocket Tech tends to kind of dimple up a little bit. Anderson Guy: And actually they claim that the bat is not playing well until they dimple. That is an unfortunate part of the situation, because the consumer will look at the bat and go, “The thing is dimpling. There is something wrong.” It doesn’t start playing well until it starts dimpling! Roy: Right. Once there are those peaks and valleys and it is able to flex even more because of those peaks and valleys, then it gives off a better response and a little bit more energy. But there are no defective issues as far as I am concerned with Anderson. If I had to pin one company, it would be Combat. They are high, high, high on return rate. Anderson Guy: What is happening with those? Roy: They are just breaking. I mean it is a composite. They only do composites and they just seem to crack. Anderson Guy: I wonder what is going to happen to them with all this composite stuff going on. Roy: College isn’t really where that business is because there is such a small fraction of kids that are playing college baseball. So it is an 18 and under business. But what will happen to the baseball business going forward with the new BB core, with new different things like colleges saying, “Hey, you can’t play with a composite bat,” will high school follow suit. There are so many different things. However, truth be told at this point, there are not going to be any changes I am sure for a couple of years because they can’t do that to the manufacturer. They have built their 2010 line. They can’t just all of a sudden go, “Oh, in 2011…” It is not going to happen. It is like a 3-4 year process before they kind of wean all of it out. You are talking tens of millions of dollars that the manufacturer would be screwed for that is not sellable. What are they going to do? Rob: Do they have to telegraph what they are doing to the manufacturers? Roy: Well they will present their case to the manufacturers. I am sure that is what their meetings where. Every year they have all these different meetings. If this is the direction that they want to go, the manufacturers need to be abreast of what the direction they are going is so that they can make the proper changes. Rob: Because they are too hot? Roy: They seem to be the hotter bat, yeah. They seem to have been performing great and performing better with use and getting hotter and hotter as you use it until it finally breaks. Combat’s probably was that the bat was just breaking. When you use it it was hot as S#!%, but then it would just break. Whether you used it a week or you used it six months, it was just breaking. Anderson Guy: Did Combat give you a length of time? Roy: None of the manufacturers give a length of time, but I think that it is kind of case by case where if they feel that…I think it is only being fair. “Hey, we will be fair with this.” Fair is if it breaks immediately, or if it breaks in a month or two months, and then they get another one and it breaks in a month, and the kid has gotten three months out of it, that is really not fair. If a kid uses a bat for eight months and then breaks it and gets a new one and uses it for a month or two, all bets are off. Anderson Guy: Because there is no telling what he did to break that bat. Roy: That is more of the softball player’s mentality that do things like that, not so much the little leaguer. But Combat is on the map in little league. They are not so much on the map really in…Senior league, they are kind of getting there. High school, not yet. But as the kids progress into those categories I think it will follow through. So they are doing pretty well. Yeah, granted we sell three or four different models from them, so it is not a ton, but it is getting bigger. Anderson Guy: Yeah, they are doing well. You hear the name all the time. They are certainly growing. That is for sure. When you have a chance, take a look at the catalogue and look at one of those previous descriptions on the Acoustic Enhancement Technology on the first page. You see that it is sort of a circular piece with a hole in it. That technology is on all the single wall bats. It is not on the double wall bats. This particular bat, and you can look in all of them because they have clear end caps on them, they call these bullet proof caps, but you can see this foam inside the bat. This is what it looks like and what it feels like. And you can see that it is a circular piece and you can see the hole that comes through it. So the idea is that they want to keep the noise and vibration down, and that is on all the single wall bats. So you will see it on the Nanotech’s and also on these single walls on the Pyrotech. Rob: Now the reason they do that is because it doesn’t sound good and they are trying to dampen the sound? Anderson Guy: They just want to keep the sound down. Roy: It doesn’t cut down on performance, though. Anderson Guy: No. It just cuts down on the vibration as well, but it is mostly a sound issue. Roy: A real high pitched bat is like a Japanese bat. If you ever see them play, all their bats have a very, very high pitch ping; super high pitched. Real loud. Anderson Guy: And they would rather have this sound like a baseball bat than to get that ping in there that you hear on some of the other aluminum bats. Roy: Also, 30% of the Japanese baseball players have gone deaf. Roy: I think that they are not. I think that they are all making them overseas now. Rob: So they are made and assembled in the US with Anderson? Anderson Guy: Yes. They are made up the street from the address that you see on all the catalogues in California. So they are not shipping the stuff over the border and sending them back assembled and all that stuff. They are made right in Orange County California. So I guess for them to make that claim they would have to be fairly accurate with that statement or somebody would be calling them on it I am sure. Rob: Well some can be assembled in the US and still have Made in the USA. But they are not doing that? Anderson Guy: They are not doing that. Consumers can go on the web and they will show you some of the manufacturing that they do in California. Roy: So what is the difference, as far as baseball bats go, in the Pyrotech and the Nanotech? Anderson Guy: Well the Pyrotech, either in baseball or in softball, is a simple technology. It is a single wall technology. It uses a fairly normal extrusion. In the Nanotech it is an entirely different extrusion. It is very durable, very long lasting, much larger sweet spot. Roy: Is it a different grade of aluminum? Roy: End caps are the same or different? Anderson Guy: End caps are the same. They use the same end cap all the way through. They use that bulletproof end cap. You will see a slight difference in the way they install the end cap on the double walls compared to the single walls. So since we are talking about it, if you look at the bottom of that bat you will see that it inserts on the end of the bat. If you look at these double walls you will see that there is this groove around here. In order to set that in tightly, this end cap, they do that groove and it really works well. That way they don’t have any pins to hold in the end cap and you don’t get any pinging and loss of the cap during use of the bat. Rob: So the Nanotech metal is aluminum? Anderson Guy: It is aluminum. It is a different extrusion. The picture explains the way the grains of aluminum are extruded. A fairly typical extruded aluminum has these much larger grains. But in this Nanotech technology, the way they treat it, much smaller grains makes it durable. And it strengthens the thing, which is really the key to the whole thing, because you can, again, make a larger sweet spot, use thinner walls, get that trampoline effect without worrying about losing any durability. Rob: So when everybody says that these walls are the thinnest they can make, do you say how thin the walls are? Anderson Guy: They would know that. I tell you the truth. I don’t know that. But since they are the engineers and they manufacture all that stuff, they would have that information if you need it. Rob: That would just be interesting to see, because everybody is talking about…We talked to five different people and it is like, “Our walls are the thinnest and get the biggest trampolining effect.” It is like, OK.
Roy: You think that one of them would take all the bats, cut them in half, and then measure it and see. Anderson Guy: I am sure that it gets to a point on these aluminums that there has got to be a failure rate. So you want to get as thin as you possibly can. So that is all the information on baseball. In softball, in fast pitch, on the page to the right you are going to notice there are three styles of bats. They start of with Techzilla. Then they go to the Rocket Tech. And then they go to the Pyrotech. And again, I would say that, depending on how you view it, on that particular page there may be as many as three different technologies. The top two bats, the techzilla and the Rocket Tech, are both double wall bats. The Pyrotech is a single wall bat. And they are all aluminum. These are cutaways. This happens to be the cutaway of a youth baseball bat. This shows you that power arch and the difference between our bat and a DeMarini bat. Originally when Demarini came out, that was just a double shell. Roy: It was a shell within a shell. Anderson Guy: Yeah. And they would take a machine and they would slam that inside piece into it to give it that trampoline effect. So on both the Techzilla and on the Rocket Tech, we both use this power arch. It is the same technology on those two bats. Here is the cutaway. You have got this arch that runs all the way through it. The idea is that it gives a little more power and brings the vibration and power down the barrel. Roy: So is the thought of that inner-core the through process of, “OK. Our bat is now dimpling,” you are dimpling it inside to create more peaks and valleys to create more energy. Anderson Guy: You get more energy and power. And the dimpling comes from the inside of that arch. So when people see it and they go, “The bat is going bad. It is dimpling,” it is really not. It is playing very well at that point. Rob: It is just showing the inner shell? Anderson Guy: It is just showing the inner shell. Now the two pieces that you have here and the one that Roy has there, that is the Rocket Tech. That was the first double wall bat that they made. That is an external sleeve. So if you look at the difference you will see that the barrel runs down here and there is a break here. So in this case, instead of doing like the DeMarini where they take the inner core, that inner barrel, and jam it into the shell of the bat, they actually did it on the outside. On that one, on the Techzilla, it is on the inside. So we have an outer shell double wall and an inner shell double wall. What happens with these two bats, and particularly with fast pitch, and the reason they did it, this comes in a -9, the Rocket Tech. This was their first bat that they came out with. This is a heavier bat, so you have to be a little better player to use it. Roy: It is definitely considered a top heavy bat, but very popular. Anderson Guy: It was their number one selling bat. The Techzilla is starting to take up speed. This is only about a year old. And the reason that is starting to do well is that is a little lighter and that is a balanced bat, where this is an end loaded bat. An end loaded bat is a little harder to play with. Rob: Which one is end loaded? Anderson Guy: The Rocket Tech is end loaded. The Techzilla is a balanced bat and lighter. So that is a little more agreeable and forgiving to more ballplayers than this one. So they think that eventually that will end up passing the Rocket Tech in sales. Rob: So on the internal sleeve the handle is really what is inside the interior wall? It is the same piece? Anderson Guy: That is correct. So you see external, and then internal, nice and smooth, and it looks like a traditional baseball or softball bat. Roy: In reality, you look at the Rocket Tech, the one in Steve’s left hand, the red one, the red part is like the part that is not there originally and it just goes over, where the other one is more of the pushed in one. Anderson Guy: And both of them, as you can see, have a groove in the end of the barrel so that you can set that end cap, as compared to the baseball bats where it is smooth. They are going to make some other changes, too. They haven’t announced them, but what they are going to end up doing is they are going to take the Nanotech technology and bring it into some of these fast pitch bats. And you will see that information sometime in the early fall for spring 2010. So they may end up taking the Pyrotech and changing it over to the Nanotech. Roy: It needs to change. It is a little tired, I think. Anderson Guy: Yeah. It was a price point bat. But at least in these other bats they have something to talk about, some other technology, where on the regular single wall, the Pyrotech, it is a price point item. Roy: Yeah. Those bats are $200+ where the Pyrotech is like $120. Anderson Guy: That is almost exactly the price point. And we are talking wholesale not retail, so it is about $120 at wholesale for a Pyrotech, but the Rocket Tech and the Techzilla are up in the $250-$325 range. The Nanotech baseball bat is a $500 retail bat.And then they map it and you are allowed to drop off a certain discount structure. So at retail you would be able to go down to about $400. Rob: So these are pretty high end bats. Anderson Guy: Very high end bats. Roy: Well all of the top end bats from Easton, DeMarini, etc, -3 bats, they are all $400 and up, all of them. This past year, 2009, they were all $389, $379, $389. Anderson Guy: Everybody was having a heart attack. Roy: “Let’s find new business to go into.” And how far away are we from $500? Can you imagine that? Anderson Guy: And now we are here. And who knows what the next technology will bring. Roy: But if it hits the ball further, people will buy it. Rob: You were talking about on the sweet spot, the little indention there in the Anderson logo and to the left of the A. That is the…? Anderson Guy: That is the sweet spot. Rob: That is not just on the demo, that is on every bat? Anderson Guy: That is on every bat. They call that it a launch pad. They don’t call it a sweet spot. That is the terminology that they are using. That is how big the sweet spot is on that particular bat, both on the -8 and on the -3 which is the adult bat. So that is the size of the sweet spot. Rob: So does it sound very different when somebody hits it not on the launch pad? Anderson Guy: It does not, because the Nanotech actually runs down from the break in the bat through the taper, so you won’t hear much of a difference. They also wanted that, because of that foam inside, you get that baseball sound through it. You don’t get that ping on it. Rob: When you say baseball sound, I don’t understand. Anderson Guy: Well in the old days you played with wooden bats, and you hit the ball and you had a whack to it. That is the way it sounds. Then they went into cheap aluminum in the beginning and you hear a ping. It sounds like a golf club hitting a golf ball. Some people don’t like that noise. Rob: But that is a pretty subjective thing? We watch a lot of college baseball and hear the aluminum sound. But when we hear that, though, that is a good sound. Anderson Guy: Yeah, because they are whacking the ball like crazy. Roy: It is a preference thing. Rob: So it is subjective. And you were saying that the foam is for bat sting as much as noise dampening? Anderson Guy: They say it is all for noise. But anytime you put a little foam on aluminum you are going to get some vibration dampening on it. So it takes a little of the sting out of it. Rob: Roy, do you have any bats that are dimpled that we could look at to show that or take pictures of? Roy: I don’t think that pictures will do it any justice. Rob: Is it really hard to see? Rob: With other manufacturers are those interior walls ribbed like that? Roy: No. This is more of a dent actually. I wouldn’t call it a rib. As stupid as this sounds, there is a very easy way of feeling it. If you put a shirt, a piece of cloth, or just a hand towel or something over this, then you can feel how much more it is dented. You really can’t take a picture of that. Roy: No, that is dented. In reality, what they do is they have like a test where you put this ring over it. And then what happens is if it doesn’t hit the table, the ground, or whatever you want to call it, they consider it out of round or too far out of round. Roy: See, if it hits the ground that is legal. Actually, this is a 2 ¼ inch diameter barrel. So this is basically the same thing, a 2 ¼ or a softball bat. See? It goes right down to the floor. Rob: Is that something that we could include with orders for people to test their bats with and make a promotional item? Roy: I have had this for 10 years. I have never seen this anywhere. Umpires, on occasion, will have something like this. Other than that I have never seen it. Rob: It is neat how people get around patents and do all kinds of crazy stuff to call it different. Anderson Guy: Yeah, they are all fishing for some other way to make it unique and different. So those first two fast pitch bats, we have those two different types of double walls. And then the Pyrotech, again, is the same type of technology that we did on the single wall on the other bat; very basic $130 wholesale bat, dampening core on the inside, and single wall extrusion. Then when we get to the next page you get to slow pitch, and it is the same idea all over again, because you are going to see the Techzilla, the Rocket Tech, and you see the Pyrotech. Same technologies, just done in a different weighting format. The fast pitch is all done by weights, meaning inches minus ounces, and the slow pitch is done with ounces. So all this is just measured a little differently, but the technology is the same. Two double walls, one single wall, and slightly different price points. Rob: And do they do the same thing? Do they shave the aluminum off to make the different swing weight because they all have to be 34 inch? Rob: So where does that weight come out? Do they take it in different places? Anderson Guy: Yeah, all throughout the whole bat. Did you have to review all of Louisville’s…Was he showing you 2010? For example, in, say, slow pitch or fast pitch, the Rocket Tech or Techzilla. It is the same bat. The rocket tech in the slow pitch is 34 inches only, and 26, 28, and so on and so forth. Whereas the other ones are different. The fast pitch version is 30-34 inches where the other one starts at 34 and gives you other ounce options.